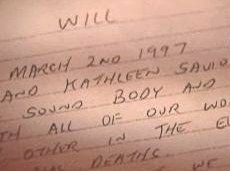 If the WILL was filed 15 days after Savio's death 03/01/2004 then why did it take until 03/23/2005 for Morelli and Marcolina to testify in court that Kathleen and Drew signed the will? IL "Questions are also being raised about a two-page handwritten will signed by Savio and Drew Peterson that's dated March 2, 1997. The document was taken into evidence by investigators Dec. 19, court records indicate. One of the two witnesses who signed the will, Bolingbrook police officer Alex J. Morelli, has appeared before a Will County grand jury hearing evidence about Savio's death. Attempts to reach Morelli and the other witness, Gary L. Marcolina, were unsuccessful. In a recent interview, Peterson, 53, said there is nothing wrong with the will, which was filed 15 days after Savio was found dead on March 1, 2004. "We just tucked it away, and I found it after she died," Peterson said of the will. "There's nothing sinister and out-of-line about it. Everything was done proper." "At the time she died, Savio, 40, was in a court battle with Peterson over proceeds from the sale of a tavern they'd owned. Peterson, she claimed, had kept all the money from that sale. The will named Peterson's uncle James B. Carroll executor of Savio's estate. Carroll went on to award Peterson control of virtually all of Savio's assets -- even though Peterson and Savio had divorced. "The actions of the Executor were not in the best interest of the Estate or its beneficiaries," wrote Richard J. Kavanagh, the court-appointed administrator for Savio's estate." Kavanagh was involved in the case because no one from Savio's family formally volunteered to represent the estate in court. He called the will a "purported will" in court papers. "My concern is that this is a handwritten will that just popped up after she died," Kavanagh said this week. "It gives you the sense that it's something that's concocted." A judge, however, accepted the will because Marcolina and Morelli testified in court March 23, 2005, that they witnessed Savio and Peterson signing the document, Kavanagh said. Peterson dismissed Kavanagh's concerns and asserted that the lawyer is angry that he couldn't notch a hefty sum in legal fees off Savio's case."